I picked up our first CSA box a couple weeks ago. I told my son that we had a special box to open up together and he was thrilled. We pulled open the cardboard and he exclaimed, “Dere’s food in here!” He was intrigued by the radishes as I have never bought them before and of course he had never laid eyes on them. Can you guys tell me what herb this is? I have only a little experience with herbs so I can’t say. I’m sad to report that I ended up going bad in my fridge! There were onions and broccoli! My son tore into the box and because we were making dinner and he was hungry, he started ripping leaves and nibbling on them. He was not afraid. He already eats lettuce, kale and spinach, so when he encountered the mystery herb (above) and the arugula, he ripped off some and shoved them in his mouth. Unfortunately, he was put off. We both needed to drink some water after we sampled those and he told me with a wrinkled brow, “Wugala is bad!” I hope I never forget that – it was hilarious and I sort of have to agree. It was on the bitter side (as are radishes actually). The produce was dirty. As in, it had just come from the farm. I was reminded that what we get from the grocery store is spiffed up quite a bit (triple washes on greens and waxes on fruit). The consequence of these beauty treatments is that we forget that our food originated from the ground. Looking at the dirt on the lettuce, I wondered who picked this food for me and how they got it out of the ground. It sounds stupid, but I’ve never harvested food before so I don’t know if people just use their hands or a big knife — a machete even? 🙂 I even wondered if the person who gathered this food for me had enough to eat and if they had a chance to eat some of these veggies too. I never had these thoughts before about my food. The farm that supplys the CSA offers family activities so I’m thinking we’ll take a trip out there to see what it’s like. We also may milk a goat if we go out there on a special day. Yee-haw! A bounty of green. It was really fun for the family. Everything was eaten except for the mystery herbs! Stay tuned: Next week we get even more diverse and interesting produce! I adore taco salads and threw this together for dinner the same night I picked up the CSA box. I normally would never buy as much lettuce as we got so I had to serve more salad on a daily basis for the next week. It made me realize that if everyone ate seasonally, we’d be eating a lot more green. I’ve never been much of a salad person (my dad called it rabbit food), but I’m really trying. It doesn’t hurt that this lettuce from the farm feels special somehow. Taco salad is a nice entry salad for a first-timer. Pour olive oil in pan, add meat and sprinkle salt on top. Add salsa. Allow meat to brown. Turn off heat when meat is cooked. Wash all greens. Chop lettuce into bite-size pieces and put in a large serving bowl. Add arugula by the handful to taste. Tear or chop spinach and add to bowl. Chop onions and add them. Toss. Quarter limes, place on individual plates. Allow people to serve themselves with tortilla chips on the side or crushed and sprinkled over the salad. Note: I used salsa in place of taco sauce since I didn’t have taco sauce on hand. I only had peach salsa in the back of the fridge. It leant a sweet flavor to the turkey meat — next time I’ll choose a darker, richer salsa (maybe a chipotle?). Also I used lime as a dressing, you can also add cheese, sour cream or guacamole if you have it and you love it! Sounds and looks great! I would for sure add my home-made guac to top it off…..I love that u didnt use taco powder…..I cannot wait to hit my local farmers market Saturday morning for some fresh greens! The herb looks like sage to me, but it’s hard to say without seeing it or smelling it in person. The mystery herb looks like sage to me, though I’m not sure. If it is, it would smell very much like the dried or rubbed sage you may have in a bottle in the pantry. And I wouldn’t expect it to taste very nice on its own. There’s a picture of various herbs here: http://www.happycow.net/blog/?p=908 You may be able to find a similar photo of spice plants if an herb doesn’t match it. You can Google Image ones that look like possibilities. It’s difficult to tell from the picture, but oregano, marjoram, basil, and thyme seem to be possibilities. Also, next time this happens, smell the herb and then smell the spices in your spice rack until you find a match. the herb looks like sage. if that was the case, munching on a leaf definitely wouldn’t taste so great. if you get it in you next CSA, you can cook it with spinach and garlic in some olive oil, or use it in pasta sauce. I’ve belonged to several CSAs over the years and the farmers usually provide a list of what you are getting each week. They’ll often suggest ways to cook unfamiliar products, too. If you don’t have that somewhere you could suggest that the farmer provide it! Looks like sage to me too, but I can’t say for certain because that is one herb I’ve never bought, because I’ve spent many of my adult cooking years as a nursing mom and sage can decrease milk supply, so I just got in the habit of avoiding it. Everything else looks fantastic! I was thinking it could be thyme or oregano. We don’t have any great bunches of herbs here in the NE. Just little pots. It is really nice to see a recipe here!! I am thrilled that you started getting a CSA. And the bit about your son is PRICELESS!! I have also really enjoyed sharing with my boys where food comes from and how we get it. I get nibbles straight from yhe bag too. But when it’s time to sit down to dinner nobody wants to eat veggies! Ha!! And it looks like I can use Disqus, but only from my iPhone. try going to google images and put in sage or some of the other suggestions and see if you can find a photo that matches up. there will be a ton of images and that’s a good way to figure out the herb. Looks like oregano to me. Sage has larger leaves. Thyme has smaller leaves, and tends to have woody stems. Fresh oregano makes all the difference in pasta sauce and chili. I’m really going to start getting into herbs after this I think. I want more basil, baby! We just started getting are CSA this past week and I agree, it is a great reminder where our food comes from. Our CSA pre-washes the veggies before they box them, which is nice. However they did send a note to be sure to re-wash them and a reminder that by using natural growing methods an occassional critter or two might be living in the leaves but that’s just a reminder that we’re eating natural veggies free of chemicals. I love supporting local farmers and getting quality produce every week. Now I hope we get more lettuce this week, so I can make that taco salad! Mmm! I found a little bug on one of our lettuce leaves so washing is pretty important! Plus, it’s good to remember that natural doesn’t mean automatically safe.Always wash your veggies first, especially if small children are eating them, after all even the big baddie botulism is naturally occurring in normal soil. Looks like the stalk of sage but some of the leaves look like oregano – kinda hard to tell without a clear picture of the leaves. You could always take it to your grocery store/farmers market and ask. Also try roasting the radishes if you get a lot one week and run out of ideas – less bitter that way. Don’t toss the radish greens, you can wilt those like spinach. I never knew that about radish greens. They were tossed, but I won’t make that mistake again. LOVE your son’s reaction, Mrs. Q! Kids really can remind you to appreciate the simple stuff. Radishes are hands down my favorite dipper for hummus They don’t taste bitter to me at all, just peppery (same for arugula). I love the combination of peppery radish and creamy hummus. The very first thing my dad and I ever planted together in our garden was radishes. They’re super easy to grow. I’ve always loved them and I suspect that growing them as a little kid is how it started. Radishes are a cruciferous vegetable which means they’re related to broccoli, cauliflower, and cabbage. Cruciferous vegetables are widely thought to have anti-cancer properties. I can’t wait to hear about your trip to the farm with your son. I really hope you get to do that. I love radishes with hummus too!!! Thanks so much Kim!! 🙂 You’re great as usual! I like this post because I’m always toying with the idea of getting a CSA box. I’m lucky enough to have a year-round weekly farmer’s market about 10 minutes from my house, so I go every week and I can pick out just what I want and how much I can afford that week, as well as supporting various farmers/vendors, instead of just one. The only thing I think I’m missing is that intimate connection with one farm. The herb looks like oregano to me, or maybe marjoram. Thyme generally has lots of small leaves. As for the radishes, I recommend slicing them into rounds and sprinkling them with a little salt for snacking. If they’re still too bitter, you could actually peel the pink rind off and just eat the yummy, crunchy white insides. Generally the pink part is the spicy/bitter part, and the white is much blander. Mrs. Q, I know you’re a busy woman – but you should start a small garden! It would be such a wonderful experience for you, and for your whole family. No matter where you live or what time of year it is, there is something you can grow. With starter plants from your local nursery, you don’t need to worry about fragile seedlings. Your son would probably love it! Your herb looks like a varietal of oregano, but I would expect it to be more bushy than stalky. Arugula is kind of bitter on its own, but it’s a great addition to add pungent notes to things like egg salad, cheese sandwiches, or anything very creamy and/or savory. Radishes are much less nasty when cooked. In fact, my husband and I both loathe raw radish, but when sauteed (especially with other veggies- try carrots and sugar snap peas or water chestnuts), it’s delicious! Judging from the tiny hairs and stalk on your mystery herb… I’d say it’s oregano. I have a huge patch of it growing in my yard, and it’s awesome. I throw it in homemade broth, soups, and Italian sauces, of course. It’s also good with roasted chicken, and beef. Very versatile. If you’re not sure of what something is, you could contact the farm and ask. Also, if you know you won’t use up a fresh herb before it goes bad, then dry it! You can do this in a dehydrator, on a very low temperature in the oven, or simply hang a bunch of the herbs upside down by a string until they’re dry. Once dry, just run your fingers down the stems to remove the leaves, and store them in a jar. Fresh, dried herbs are MUCH better than what you can buy in the store. A great way I love to use up fresh herbs: Slice and spread some goat cheese on crostini, then top with various fresh, chopped herbs. Toast in the oven for a few minutes. YUM!! You can make your own crostini by thinly slicing a baguette, brushing with olive oil, and toasting in the oven. There are great ways to preserve fresh herbs. You can chop them and freeze with a little water in ice cube trays to throw in soups and dishes later, dry them, or make herbed butter. I LOVE goat cheese with fresh herbs, too! That combo is also fantastic on Akmak crackers if you don’t have a baguette or time to make crostini. In the summer, an omelette or scrambled eggs with goat cheese and fresh herbs is one of my favorite things to have for a quick light supper. If you pair the more bitter greens w/ sweet things it will balance the bitterness. ex. strawberry/ peach arugala salad. Also, that mystery herb is great for greek style dishes a favorite of mine is tomato-cucumber salad w/feta dressed w/ oregano, lemon and olive oil. totally yummy!!! I love Arugula, watermelon and goat cheese as a salad. My vote is oregano for the mystery herb…usually I can only tell by smelling (or a list from the CSA). For the arugula, my favorite salad is to chop it fine(ish–can you dice arugula? Make it fork friendly), add chopped walnuts and shaved parm (mine is from Trader Joe’s) and use oil and balsamic vinegar and salt & pepper for dressing. I made mine with barley, since I randomly had some in the cabinet. I also just used my food processor to chop things fine instead of the paper-thin slice (I love Heidi Swanson but it’s pretty clear she does not have kids). It mellowed out the radishes. Enjoy! We love our CSA for the same reasons…random produce, arriving and inspiring. I don’t want to sound like a moron here but I had a little bit of trouble trying to figure out how to comment on the post…maybe you could post on the sidebar a section entitled: Commenting on Posts for Dummies or something. Thanks and keep it up! Love the idea of this recipe…I think I may be borrowing it this week. Agree, it’s unusual to have to click only on the post on which you want to comment. That really surprizes me that they didn’t tell you what was in the box. I’m the kind who has to know what it is so that I can really make a decision, because there are some things that you like and you want to know what they are in the future. My latest favorite salad is gorgonzola, dried cranberries, and balsamic dressing on fresh spinach. Yum! The herbs are definitely oregano – possibly “Greek Oregano”, since the leaves look rather large (I used to have a Greek Oregano plant). 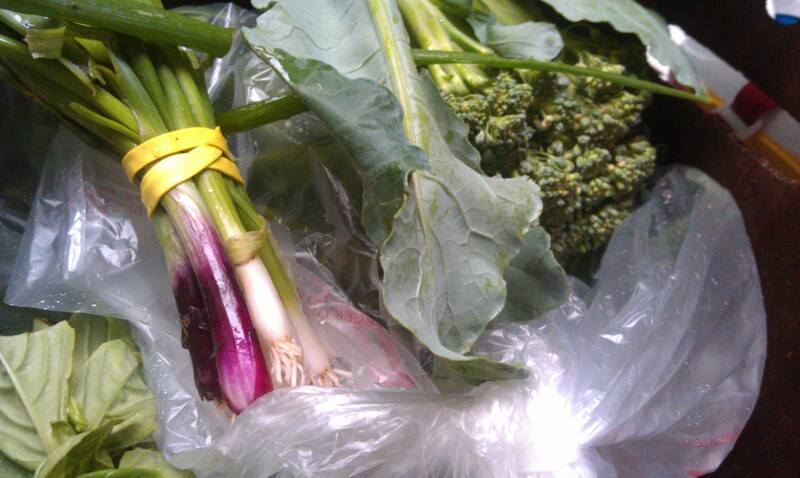 We’re also getting CSA produce for the first time this year. I chose the CSA we have specifically because of the amount of greens it provides. However, I don’t think my family of four could actually “eat” all those greens. We do consume them, though, by juicing them. Juicing is such a great way to enjoy greens. I double juice my pulp, too. Don’t want to waste any of that CSA goodness. I agree that arugala is not good! I keep a bag in the freezer for vegetables that I don’t eat in time or the “less desirable” parts of the vegetable. I use them to add flavor when I make chicken stock! That may be something you’d want to do with your extra mystery herbs. 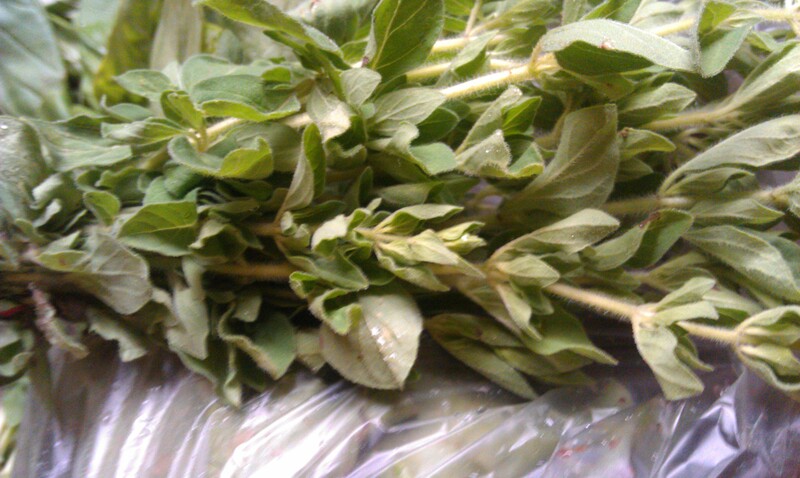 I know a lot of people are saying oregano but I think the mystery herb may be marjoram, it is very similar to oregano. I hope you manage to find out the answer to the mystery herb and post it here for all of us! Did you ever find out the mystery herb? My vote would have been for purslane? Great source of vitamin C, grows like a weed. Bitter tasting, a bit lemony. May put it on salads and easy to find in many northern/cold weather gardens from early spring on.